Nurses have a unique leadership role in ensuring a digitally enabled health system delivers on the promise of better health for all Australians. A joint position paper released today by Australia’s peak bodies for nursing and digital health says as the largest single profession in the healthcare workforce, nurses need to be recognised and acknowledged for their enabling role in the digital health movement. The paper says nurses have the potential to deliver better patient outcomes as well as facilitate a better consumer and clinician experience. 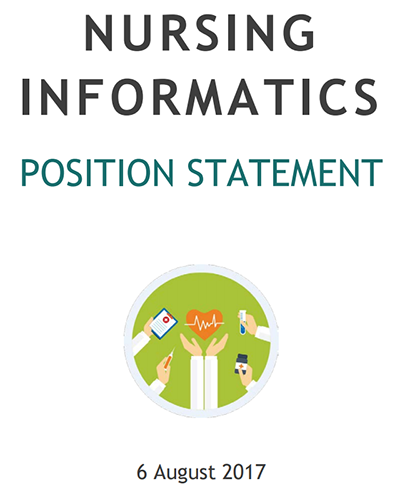 Produced collaboratively by the Australian College of Nursing (ACN), HISA and its special interest group Nursing Informatics Australia (NIA) following sector consultation, the paper is the first national statement to affirm the role of nurses in digital healthcare at all levels and in all health settings. With seven key actions, it urges nurses and midwives to lead in decision-making as well as to partner; to obtain the knowledge and experience to act as knowledge brokers and to transform services and empower patients in self-care.